Griff''s was created to help men to look, feel and be more confident by providing exemplary styling, grooming and barbering products—all pure and concentrated ingredients. Named after the owner’s grandfather—a world war veteran—the lineup includes everything from scalp cleansers to styling products to keep men looking and feeling their best. Askderm.com is the exclusive online retailer of Griff's Hair Care products. Previously Griff's Hair Care products were only available at 18|8 Salons. Griff's products are now available to purchase online here. Griff's line of hair products utilize the purest and most concentrated form of quinoa on the market. Quinoa (pronounced keen-wah) is a nutritious grain that has been rising in popularity over the last five years due to its high nutrient content. This super food is known for its amazing health, skin, and hair benefits. Quinoa Benefits for Hair: 1. Provides Scalp Nourishment & Hydration - Humectants in quinoa keep the scalp well-conditioned and protect the scalp from enviornmental hazzards like pollution. 2. Treats Dandruff - Iron, Calcium, and phosphorus seal in moisture to the scalp to keep dandruff from forming. 3. Repairs Damaged Hair - Amino acids act as natural strengtheners to protect the shaft of 4. Split End Treatment - Protein in quinoa helps to seal split ends while preventing split ends from getting worse. 5. Helps Maintain Natural Hair Color - Amino acid, Tyrosine, encourages the re-pigmentation of hair while maintaing the natural hair color. 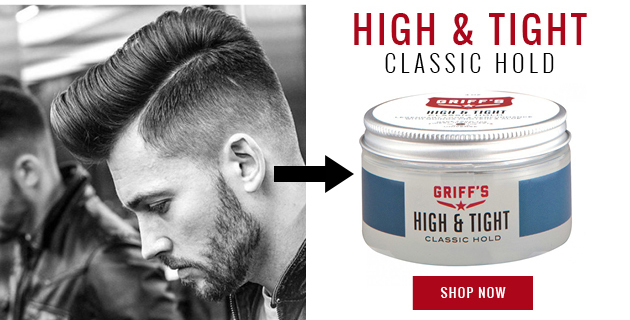 Griff's High & Tight Classic Hold pomade provides a medium hold with a semi-wet look. It gives your hair volume and the stay your hair needs but unlike other brands, it washes out easily. Formulated with the purest and most concentrated form of quinoa on the market to give your hair maximum strength and volume. 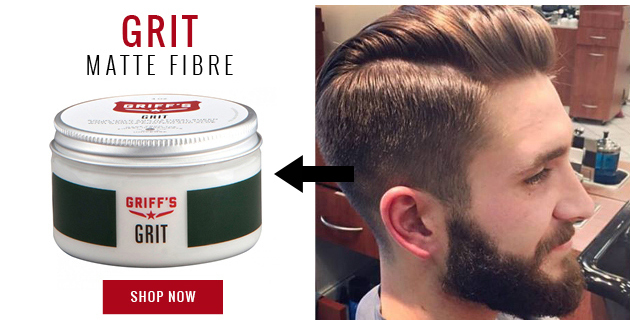 Griff's Grit Matte Fibre pomade provides you with a natural looking hold with a matte finish. Formulated with natural beeswax for a long-lasting style and shine while being easy to wash out. The Grit pomade is perfect for men with thinner, finer hair to give them a fuller style.